The first thing that struck me about this recording was Kersten McCall’s gorgeous flute playing. As a flute player myself, I hear a lot of recordings of flute repertoire, and it is rare to hear musicianship of this calibre; the flute is used as a tool for expression, with spine-tingling phrasing and a beautiful warm sound. 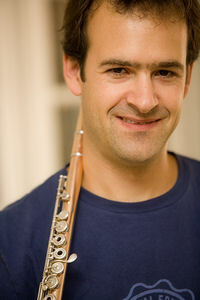 McCall is principal flute of the Concertgebouw Orchestra in Amsterdam, and his playing is undoubtedly world class. His colleagues in the Linos Ensemble play here to a similarly high standard; there is a good sense of ensemble, and excellent balance throughout, and the music is communicated well. The intonation is particularly well handled, with the difficult moments always perfectly in tune. 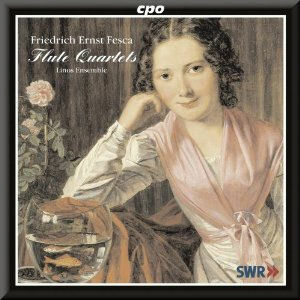 Fesca is a late Classical composer, who was also known for his skill as a violinist. He was born in Magdeburg and continued his studies in Leipzig, before taking posts in Cassel, Vienna, Carlsruhe and Baden. He composed four flute quartets which were published in 1825-26 and were thought to have been composed shortly before publication, at the request of the publisher, Simrock. The quartets were popular and the publishers are thought to have sold many copies. These quartets are of substantial length - each is between 20 and 25 minutes long - and have four movements. The first has a lighthearted feel, especially in the first movement and in the charming Scherzo. The music is well structured, with enjoyable melodic lines and interest within the accompanying parts. He often creates a sense of dialogue between the instruments and there is a lovely sense of character which comes through the music. The scoring allows the solo flute line to soar, in a singing style rather than with a sense of virtuosic showmanship. The string parts blend well to create a supporting accompaniment. The second quartet, in G major features dotted rhythms in the first movement which contrast with lyrical lines and minor key sections to give a sense of joyfulness. The second movement is a seductive slow intermezzo, played here with enormous sensitivity and some stunning quiet playing. The third and fourth movements retain Fesca’s characteristic lightness of touch and harmonious scoring. The playing is consistently excellent and captures a wonderful sense of charm. The final quartet on the disc - the fourth is not included here - begins with a cheerful and sparkling opening movement. There is a sense of fun and enjoyment about the performance. The minor key slow movement is darker in tone and features some beautiful melodic writing. The third movement features some interesting imitative writing and bright outer sections which contrast with an intimate minor interlude. The finale has flowing semiquavers and a jaunty opening theme, and maintains a bright mood throughout. Overall this is an excellent recording of some charming repertoire. I very much enjoyed the sound of the ensemble and look forward to hearing more of McCall’s breathtaking flute playing.